This ebook features a unique collection of 200 scales laid out for guitar players is one of a kind! 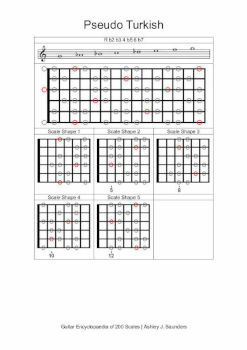 Each scale is shown in the key of G and is scale written out in notation and across the whole fretboard. Where possible, the scale shapes have also been included. It's likely that the first scale you learnt on guitar was the pentatonic minor. And while it's a cool scale, there are literally thousands of them. Most of which you're missing out on. 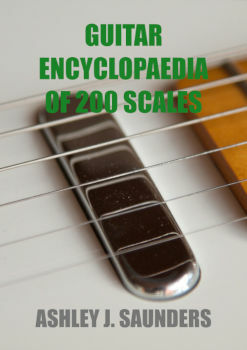 It's the reason I created the Guitar Encyclopaedia of 200 Scales eBook. By learning more scales, you will advance your harmonic and melodic understanding. The guitar's fretboard will become easy to master as you'll get used to playing across it in multiple keys. Plus, you will have more options to use when soloing. Inside this eBook, you will find that each scale is shown in the key of G. The scale has been written out in notation as well as across the whole fretboard. And where possible, the scale shapes have also been included. This makes it really simple to learn a new scale on guitar. This eBook is aimed at those want to learn new and exciting scales for use in their music.